My brother Brendan took this photograph of me posing on our bed in 1966. Two of my brother’s slept up the top end of the bed and I slept down at the bottom. One brother was two years older than me and the second was a good few years younger. It’s really a large single bed that the three of us slept in and it had a Candlewick Bedspread on top. At times my Da’ often got in beside me for the night or my young nephew would end up there also. Brendan’s original guitar is hanging on the wall because there was no where else in the room for it. My new one was kept in it’s original cardboard box under our bed. I bought this guitar for £5 in Delaney’s of Parnell Street. Brendan borrowed the £5 from the newly formed Cabra West Credit Union for me and I paid it back at 2/6 a week. You had to go to Finbar’s Hall every Friday night to pay your money in. Sometime later Brendan was stuck for a few bob to bring his moth out and got me to pawn the new guitar in Rafter’s of Gardiner Street. I lost the ticket to redeem it with. 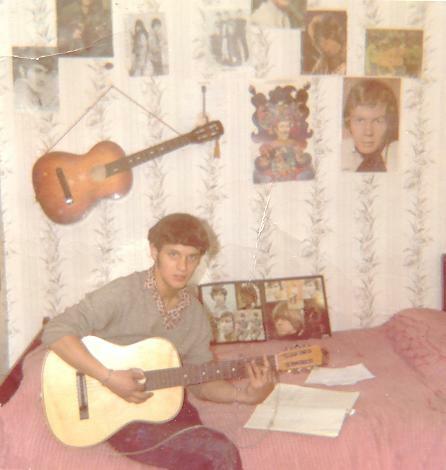 The book on the bed is where I wrote down loads of songs from the radio and tried to work out the chords on the guitar for them. The LP is the Rolling Stone’s “High Tide Green Grass”. The large poster on the right is the original drummer with the Bee Gees and Johnnie McEvoy is also up there.